Ancient legend is full of stories about people, places, and things. Their stories tell of human flaws, sacred places, and all kinds of things used in various exploits. A river runs through some of the ancient Greek stories that are remembered in the constellations. It should be no surprise then that the river is remembered up there too. Eridanus represents the Nile in most legends. In others, it’s the Euphrates. And there are other stories equating it with other rivers. Those who lived in the Middle East long ago thought the Nile and Euphrates were connected to another body of water. They believed this one body of water and its tributaries surrounded the entire world. They had no idea that all the oceans of the world really are just one big water body. In one legend, Aquarius, the water bearer, is pouring this river from his containers of water. In another, the unfortunate Phaeton wrecked the chariot that carried the sun across the sky. Zeus, zapped the chariot with a thunderbolt as it traced a dangerous route across the heavens. Phaeton fell into the river and drowned. The brightest star in Eridanus is called Achernar. The name is Arabic for “river’s end”. Cursa means “footstool of the giant” because of its place near Orion. Zibal means “ostriches”, because that is where some stories said ostriches lived along the river. Acamar is another star whose name means “river’s end”. Astronomers know of more than three dozen galaxies in Eridanus. But they also know of a very large area seemingly devoid of any galaxies or any other material at all. Even microwave radiation detectors find it empty. Some call it the Eridanus Supervoid. Other such voids are known. Scientists don’t know why there are some spots in the sky that seem to contain nothing at all. 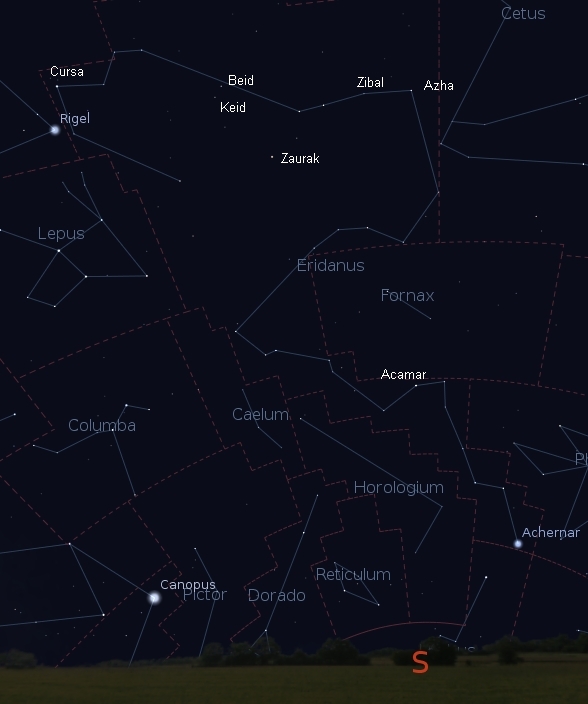 You can find the mostly dim stars of Eridanus by looking at Orion. The river starts just west and south of the bright star Rigel. After a jaunt northeastward toward Orion, it goes west, then south, then east again. It keeps going generally in a southwestward direction. Most people in the northern hemisphere don’t see that part of it. If you’re in the northern hemisphere, don’t step in any real rivers to get a view of Eridanus. It’s cold this time of year. ¡SkyCaramba!